Home prices dipped in California’s largest cities in January 2019. Home prices decreased compared to the prior month across low-, mid- and high-price tiers in Los Angeles, San Diego and San Francisco. While prices have decreased over the past few months, the statewide average for low-tier prices was still 4% higher than a year earlier. Mid-tier prices were 2% higher and high-tier prices were 1% higher than a year earlier. Prices rose through much of 2018 but began to fall back towards the end of the year due to several economic factors pushing the housing market toward its next recession, likely to set in during 2020. Chief among these factors were rising interest rates in 2018, which reduced buyer purchasing power and caused home sales volume to slow. 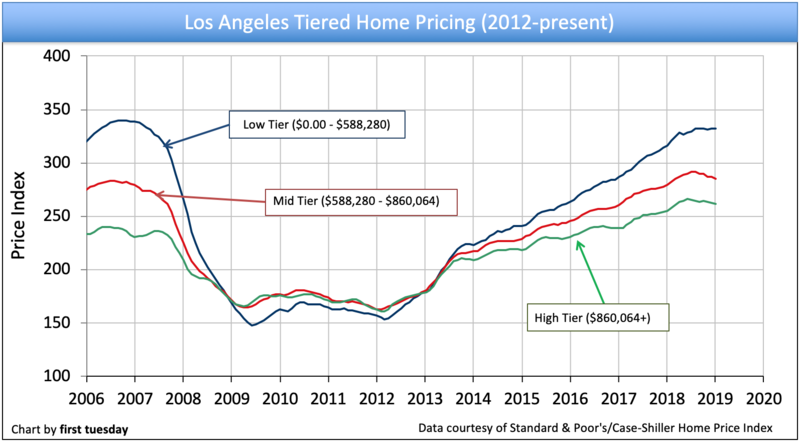 When home prices fall, they tend to start in the high tier, followed by the mid tier. Low-tier prices are usually last to fall, as they have the most support — momentum — from homebuyers. 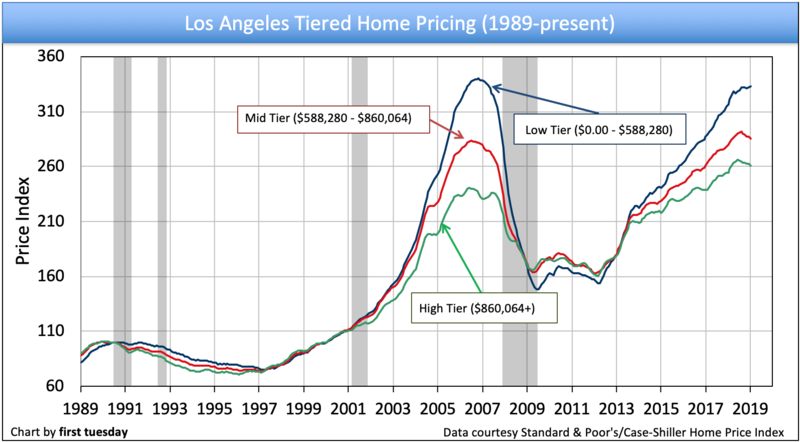 Prices are now declining across all three tiers. 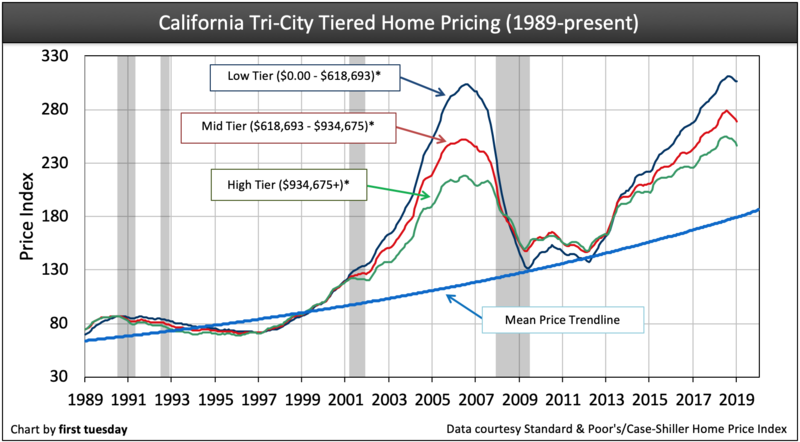 The cyclical peak in home prices occurred in California during the third quarter of 2018. 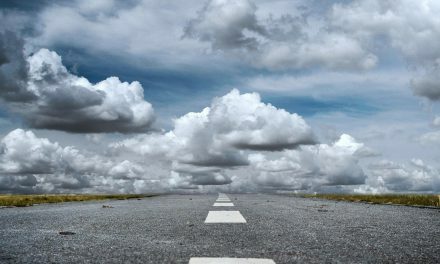 When reports for spring sales roll around in 2019, we may see a meager month-to-month uptick in sales and pricing, but any increase will be brief and shallow. The overall trend for the next couple of years will be downward as we head into the next recessionary period in 2020. Updated March 28, 2019. Original copy posted September 2009. Charts are updated monthly. There is a two-month lag in reported data. 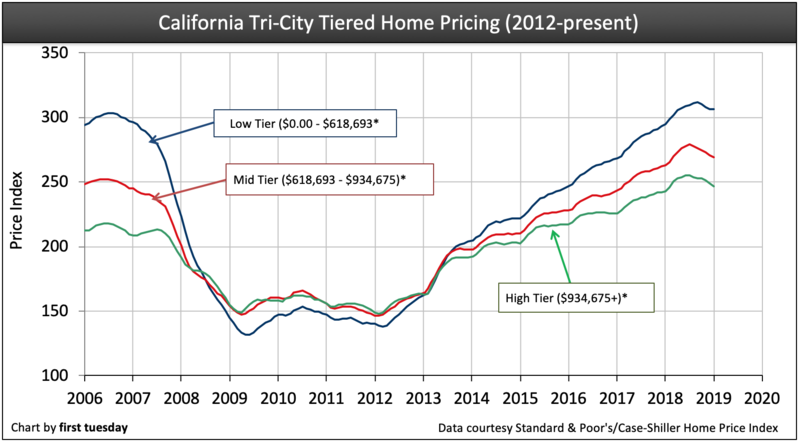 *The three pricing tier amounts listed in the Tri-City charts are averages of the tier constraints in Los Angeles, San Diego and San Francisco. The above charts track sales price fluctuations of single family residence (SFR) resales in California’s three largest cities. Each city’s sales prices are organized by price tier, giving a clearer picture of price movement in each price range within the market. 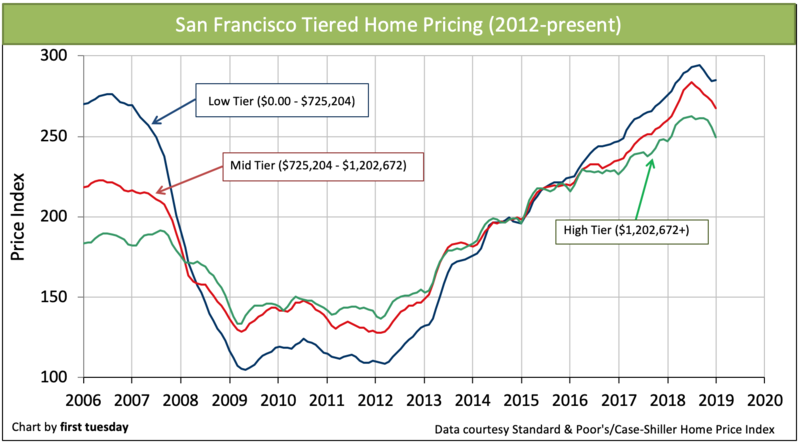 To understand the “big picture” of the disparity between low-, middle-, and high-tier sales fluctuations, look to the Standard & Poor’s/Case-Shiller home price index as the authority. The index is an invaluable source of information and price comparisons for California’s three major cities and the state as a whole. The above charts track changes in specific tiers according to the Case-Shiller home price index, displaying how different ranges of house prices in the market perform in comparison to one another. Portrayals of pricing in California take many forms. The index figure is particularly useful as it displays relative price movement rather than a misleading dollar amount which actually fits no single property. Unlike many media sources, first tuesday shuns the simplistic median price approach. That approach tracks all home prices as a single tier by assigning them one average price. This one-price-fits-all dollar amount looks good on paper, but means nothing in the real world since it is a mathematical abstraction. 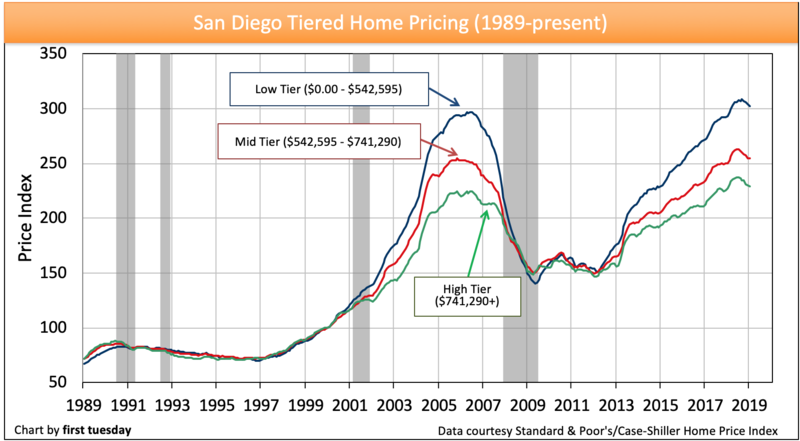 Neither the actual nor adjusted median price represents the price of any single property. For the vast majority of properties sold or for sale, the median is a mathematical distortion. Brokers seeking the actual value of a specific property would do well to remember that there is no such thing as a “median priced home” — you simply cannot find it. Median price is a statistical point which fails to work in the analysis of any price-tier analysis of properties, much less an individual property. To determine how real estate will actually behave in the future, you cannot compare the price of a low-tier property with that of a high-tier property. Properties in different tiers move in price for very different reasons. Although the market tends to move in the same direction over time, the percentage of movement can vary greatly from tier to tier. Price persistence is the tendency of listed prices in owner-occupied real estate to resist change, staying high even when the market for resale homes has dropped, a condition more commonly called sticky prices, downward price rigidity or the money illusion. the steady jobs recovery across California, allowing homebuyer incomes to (almost) keep pace with home prices. However, the Federal Reserve (the Fed) continues to increase their benchmark interest rate going into 2019, and the resulting loss in buyer purchasing power are causing home prices to finally begin to cool. The reluctance of prices to adjust quickly to real financial conditions in the real estate market is due to one particular cause; the difficulty of finding a property through a gatekeeper such as a broker, agent or builder, and then agreeing to an appropriate price, called search frictions. In the hunt for a home, these search frictions make it far more difficult for properties to change hands and prices to be negotiated at current market rates. This prevents deals from being made when making a deal is what everyone has in mind. 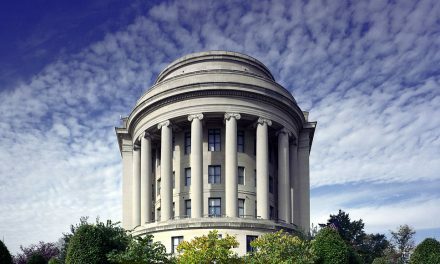 Thus, these frictions hinder the speedy resolution of a financial crisis, and work to the future detriment of the multiple listing service (MLS) environment. Seller’s agents could be far more helpful by figuring out what it is they are selling, the due diligence rub that they so far are finding difficult to act on, then prepare a humble package about the conditions of the property improvements (TDS/NHD and reports), its title, its operating expenses, neighborhood statistics and the like for the buyer and the buyer’s agent to be able to make fast decisions. Japan’s financial crisis of 1990 included a collapse in both commercial and residential property values. Income property prices were especially volatile throughout the collapse, ultimately falling faster and deeper than owner-occupied residential prices, but bottoming sooner since investors are more rational. Owner-occupied residential real estate, which had a much higher variety of pricing and a greater burden of debt, also eventually fell catastrophically, but less dramatically. The difference in price movement is because income-producing real estate is more easily evaluated (by capitalization rates (cap rates), income flow, and replacement costs) and typically less burdened by high loan-to-value (LTV) debt ratios so equity remains to be worked with. These conditions of ownership make it easier for buyers and sellers to agree upon an appropriate price; thus, providing the owner with the ability to cash out — greater liquidity. The relative ease of income property evaluation makes that part of the real estate market a more exciting and less predictable field, as cap rates can change dramatically, altering market values in a moment. Conversely, owner-occupied residential property moves slowly and steadily with sticky pricing, sellers not reacting to the recessionary market forces existing at the time. The historical reality of market implosion. Readers should remember that real estate pricing often fails to correspond to objective reality. The discrepancy between the prices that homeowners set and the prices homes actually garner in the market is attributable to the human factor. Outrageous bubbles become more outrageous, and collapses become more devastating, due to a common set of irrational beliefs about market behavior. The most dramatic example of market fallibility took place in the very recent past — our Great Recession. The attractively simplistic application of a “mathematical abstraction,” as in median price reporting or a comparison of median prices over time, will never produce as useful a result, since the arithmetic is being applied to an asset which is as unique and variable as a parcel of real estate distinctly different from any other parcel. The overall median price also gives an erroneous representation of the pricing of property in the market. The rate and extent of changes in property value prices varies dramatically both within and between low-, mid- and high-tier properties. While prices for low-tier properties are most volatile, generally changing quickly and dramatically as depicted in the charts above, high-end properties are slower to react to the rise and fall of the market. Different tiers often move in opposite directions at the same time, and when upward or downward price movement occurs, each tier experiences a different percentage of price change. Financially illiterate homebuyers in distress – agents to the rescue! For more accurate and refined data that gives a reasonably meaningful picture of market pricing, tiered pricing charts like those shown above offer a more sensible source — but not the best. Now that the housing price bubble of the mid-2000s has burst, we need to know more than ever about the economic factors that cause real estate prices to move quickly or slowly. Also important is whether those factors affecting price can help us predict the speed at which different segments of the California real estate market will recover. When Japan’s real estate market collapsed in 1991-1992 following its last financial crisis, prices dropped in both residential and commercial real estate, and continued to drop for a decade, dragging government-supported banks with them. However, when Japan’s commercial real estate prices fell, they dropped dramatically faster and further than prices for owner occupied residential real estate. If the Japanese crisis-reaction precedent for sustaining insolvent “too-big-to-fail” banks is the track our government stays on, we can expect similarly dilatory results in our own real estate market. Illiquidity refers to the corresponding inability for an owner to cash-out on the sale of property, one factor in a vicious cycle which causes price stagnation and inhibits recovery from a financial crisis and recession. Greater liquidity, when buyers and sellers can easily obtain money and get rid of property at agreed upon prices (read: market prices), leads to a more volatile market, for better or worse. In the case of a market collapse like that which has been underway since 2006, home prices are unable to stabilize — bottom out — until property pricing comes to reflect cash values. On the other hand, price persistence (sticky prices) of sellers can cause property values to remain artificially inflated long after a collapse has occurred – until the cash price is finally established. The reluctance of prices to adjust quickly to real financial conditions in the real estate market is due to two causes. The first cause is the difficulty of finding a property through a gatekeeper such as a broker, agent or builder, and then agreeing to an appropriate price, called search frictions. Seller’s agents could be hugely more helpful by figuring out what it is they are selling, the due diligence rub that they so far are finding difficult to act on.Then prepare a humble package about the conditions of the property improvements (TDS/NHD and reports), its title, its operating expenses, neighborhood statistics and the like for the buyer and the buyer’s agent to be able to make fast decisions. 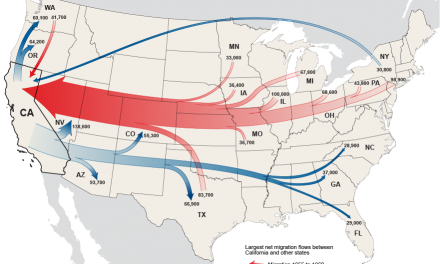 The second cause of this lag is the crippling load of debt underlying so many California homeowners which makes leaving a property (for those who must relocate) more difficult, one cause of an enduring recession, called debt overhang. Excess mortgage debt on a property forces buyers and sellers to ascribe distorted values to the real estate, part of the money illusion driven by property debt. Ultimately, negative equity homeowners are forced to become more financially rational. The FRBSF’s study indicates that if a shock to real estate fundamentals occurs, such as the artificial increase in homeownership funded by the mid-2000s subprime mortgage boom, then the steepness of the initial homeownership price drop in the recession and the speed of homeownership’s eventual price recovery both depend upon the prices brokers choose to set for a property’s dollar value. When brokers can broadly agree upon an appropriate price, property values will reset constantly to their basic worth — cash values — without prices and sales volume rocketing to the artificial heights of a housing price bubble or the artificial lows at the bottom of the bubble’s collapse. Thus, the historical (long-term) trend line of property prices will be more closely maintained from year to year; boring, but better for the livelihood of all involved. However, the combination of search frictions and mortgage debt overhang tends to make property owners reluctant, or simply unable, to sell for the property’s fundamental value (the “true cash value” of the property at any given time), especially in negative-equity, owner-occupied residential real estate. Instead, sellers keep their homes on the market longer, hoping in many cases to avoid default, fishing for the rare buyer who might be willing to pay a higher price. Seller’s agents in high-end properties tend to pander to these instincts. This leads to price stagnation, in which the fall of prices is unnaturally prolonged: not a good thing, since it greatly extends the length of a market collapse, as it did in Japan in the 1990s and Mexico in the 1980s — and appears to have done in California’s high-end properties that, with the exception of the Bay Area, are suddenly much lower (and replete with foreclosures). The difference in price movement is because income producing real estate is more easily evaluated (by capitalization rates (cap rates), income flow, and replacement costs) and typically less burdened by high loan-to-value (LTV) debt ratios so equity remains to be worked with. These conditions of ownership make it easier for buyers and sellers to agree upon an appropriate price; thus, providing the owner with the ability to cash out — greater liquidity. Readers should remember that real estate pricing often fails to correspond to objective reality. The discrepancy between the prices that homeowners set and the prices homes actually garner in the market is attributable to the human factor. Outrageous bubbles become more outrageous, and collapses become more devastating, due to a common set of irrational beliefs about market behavior. The most dramatic example of market fallibility took place in the very recent past —our Great Recession. is the writing staff comprised of legal editor Fred Crane, writer-editors Connor P. Wallmark, Giang Hoang-Burdette, Carrie B. Reyes, Benjamin J. Smith, Oscar Alvarez and graphic designer Mary LaRochelle. 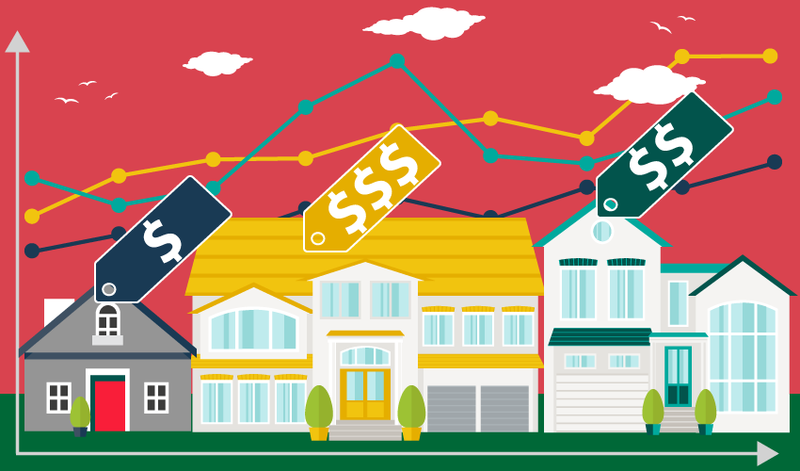 POLL: What direction will home prices go in 2016? What is the benefit of the new SB-35, and who will it be enforced by in order to expedite more new housing for California communities? How will it be enforced? Inland Rural areas in California are in desperate need of new infrastructure to provide a jobs/housing balance that inter-connects them to the Urban areas. Lack of an equal jobs/housing balance only creates blight and poverty and tax payers ultimately pay the price socially and economically. Not all people want to be in the heart of technology or high paying jobs and high rents. They just want to NOT be in the hub of non affordable real estate prices and long commutes to work in order to enjoy a higher quality of life. Perhaps, a priority to invest in inter-state transportation that serves California residents in a more equal distribution for it’s tax payers. Invest in transportation and GO GREEN! First Tuesday keeps trying to convince us that prices are in a bubble and won’t go up. But the reality is that prices just keep going UP—UP—UP!!!! In my opinion First tuesday has no ability to predict future prices and their opinion as to future prices are totally worthless!!! No, Buffalo, you’re screaming at the messenger, First Tuesday. All First Tuesday is doing is reporting what many sources rely upon (though we all may disagree): Robert Shiller and his home price index. First Tuesday was not predicting anything. They are merely reporting Shiller’s stuff. If you don’t like FT’s reporting you can write an intelligent one of your own. I’d like to see how you do. Southern California coastal cities continue to see rising prices. In 10 years, I expect they will double. And, they are already at all time highs. As far as the lower sales volume, that is being partially caused by the tax laws. Now a single owner can only take 250K from a sale tax free. A married couple is at 500K tax free. The rest of the gain is taxed. Add the 6% sales commission … the result is many Southern California beach homes have 7 figure gains and the owners are never selling. That is causing extremely low volumes at the beach. The only sellers are either forced sales, or estate sales. Move up buyers are not willing to pay the tax load for a trade up. Also, your bubble graph is very misleading. If the graph went started from 1900, the bubble would not look like a bubble. Excellent point. The tax impacts of selling real estate at these high prices does mean fewer listings, and continued price increases associated with this tax-driven scarcity. 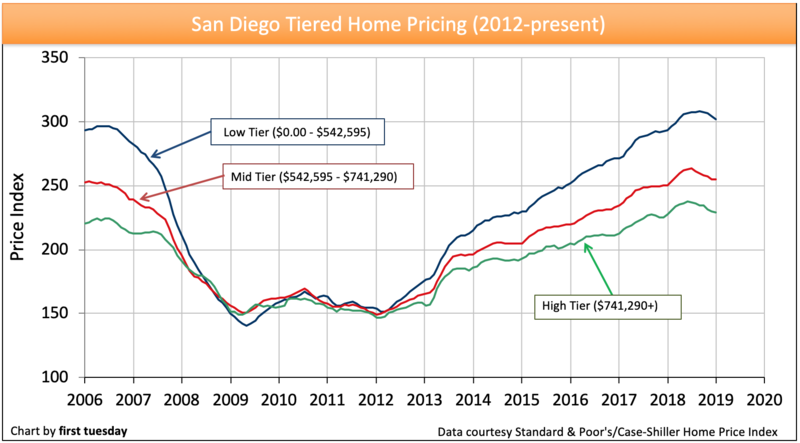 If prices double in all major cities along the coast then something has to change. Today it seems prices are allowed to climb even in the face of climbing interest rates and unfriendly tax changes simply because of tight inventory. If we actually had enough housing on the market in California to where multiple people weren’t fighting to overpay for crap shacks then sellers would have to lower prices to get all the people priced out of the market to buy. I think its likely as things get worse inventory wise and interest rate wise, we will see lending standards loosen again. Until that happens I agree I think it is unlikely we will see any kind of mass selloff. On a national basis adjusting for inflation we’re looking at 2002 “real housing prices.” I know everyone who doesn’t own a house would like it to be 1990 levels but it isn’t and isn’t going to be. That would be another 40% drop and why? With the lack of economic catastrophe, excellent underwriting since 2008 and near lack of homes with negative equity what will cause the crash? A mad rush of people who aren’t underwater selling their houses because they’ve got a job? I have been a broker 34 years in Los Angeles. up on forecasting. Be humble and admit you were wrong. If you were to look at the graphs, you would see that there is a certain pattern. Alan? The last real estate bubble burst was caused by government interference in the market. Everything was fine until Fannie and Freddie were blackmailed into making the liar loans (I know this to be a fact. Blame goes to Barney Frank, Bill Clinton and Jimmy peanut brain Carter) that had been the province of a few privately funded and owned subprime lenders. That is what caused a mad rush of unqualified people into the market. (I’ve been in lending and real estate for 35+ years) And then Fannie and Freddie, who wrote the guidelines for those loans, had to sell the loans on the market. Obviously, they took them to Wall Street. your article regarding the current and future market is well taken. down. This could be due to the end of the year Real Estate activity. All I Can say is your article speaks nothing but the truth. Do you have info on the East, South, and North bay tiered markets? San Francisco is not nearly equivalent to those locations and I would appreciate very much to know the tiers and movement on them. This is good analysis of breaking down the real estate market into 3 tiers. Indeed as an agent … I have often used a similar analysis to help buyers and sellers in make their real estate investments appropriately. 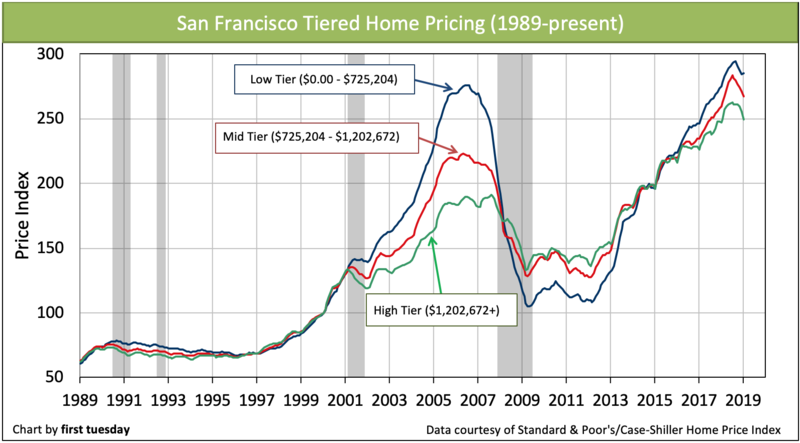 As a corollary to the 3 price tiers … I also use a similar analysis by properties distance from the employment hotbed. With the homes at the heart to be in tier 1…. say homes within 5 to 10 miles, 10 to 40 miles, and 40 to 75 miles. Great Articals. The next real estate top is projected about 2023, but until about 2017 real estate prices are going to be an up and down roller coaster ride, keep your powder dry, better prices are right around the corner, watch us baby boomers dump our over levered homes in order to get out from under the big payments to be able to afford to retireeeee. Not sure that is accurate. If history continues, the “7 year” mark seems to indicate top and bottom of the market. You can see it in the graph. That would show that 2012 was the bottom, which might indicate 2019 as the top. Where do you see, or whom have you heard from, prediction of 2023 and from what indicator(s)? Pops? I agree with your scenario, except it’s going to be sooner than 2023 for sure. What do you think is going to happen when interest rates go back to normal? That would be about 7-7.5%. The ONLY thing that can happen is price declines. Incomes are not going to be able to keep up with house payments being 35% higher for the same price house. Economics 101 says that prices will have to decline. When is this going to happen? I say next year and into 2019; NOT 2023. I agree, let’s keep our powder dry and start buying when the selling starts getting crazy. waste a great buying opportunity. Real estate runs a 17 to 18 year cycle. Next top 2023 to 2024. Watch as these people try to call a top for the next decade. They are all trying to make a name for themselves. amounts of money are being dumped in the system. The next top is when statewide affordability reaches 17%. Hows that statement looking now mr “making a name for yourself” lol. Top is near or hear bud. Excellent graphs, but the “matching” could be the “HUMP” vs. “FLAT LINE” and thus this could show the weakness of the cheaper homes “owners & shoppers” vs. the more expensive properties. AKA the higher the price, the less the volatility or “beta”…. these are adjusted for inflation, unless you think the inflation rate was 0% from 1989 to 1999. I’d love to see these adjusted for inflation. Then the prices today would likely be somewhere below the 1990 peak. How often are your deals which are contingent on new financing killed by low appraisals? Occasionally, but not on most deals. from POLL: How often are deals contingent on new financing killed by low appraisals? Check out our previous poll here. Zestimates are great conversation starters with sellers and buyers. Zillow has done more for our bottom line than NAR ever has or will. Don’t fight the current of the river, learn to run with it. Disruption is inevitable in any industry that is fragmented or inefficient. Granted, it does feel like armchair experts and platforms are plentiful in real estate these days, but when the tide rolls out we will see the value proposition of the truest professionals in this industry shine once again. Get real estate news straight to your email. Do you have inside information you want the first tuesday editorial team to investigate? Let us know!